Caul and band sewn and worn inside out. 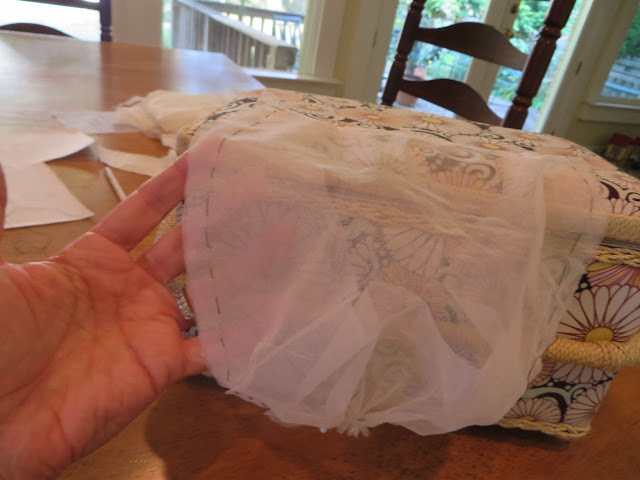 Last time, I had showed you the toile of a dormeuse cap I am making up, sans any sort of gathering or pleating on the "wings". 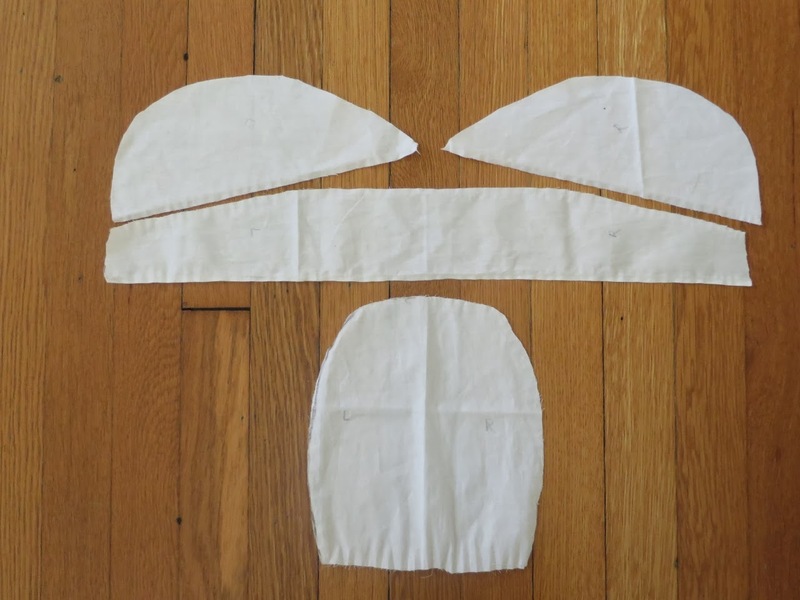 This post will lead you through the first part of cutting out and constructing the cap. 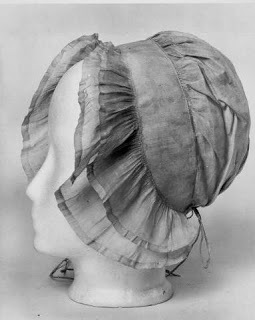 My actual dormeuse design is more complex than the toile: it's a silk gauze version of the extant linen cap we saw in the last post. I will certainly add a ribbon around it to decorate it. I have read available accounts of cap-making online. 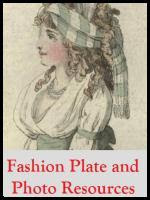 Most useful so far have been "How to Make a Cap", by Sue Felshin, on the 18thCNewEnglandLife site, and The Mantua Maker's "Cap Research". The Felshin article dates to the early 2000s, but is thorough and acknowledges when it departs in construction methods from extant caps. It also helps that I have an antique lace cap in my collection. 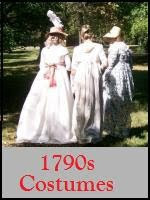 To all appearances it dates to the early 19th century, but the methods used to make it are nonetheless good to know. I am sewing the cap using part of the arsenal of 18th century stitches: backstitch, fell stitch, whipstitch, stroked gathering. 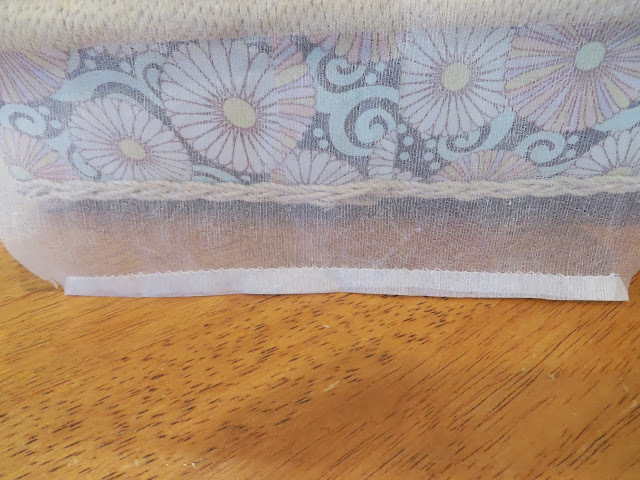 I am using whichever stitch seems to make most sense for the seam/hem, rather than following a given pattern. 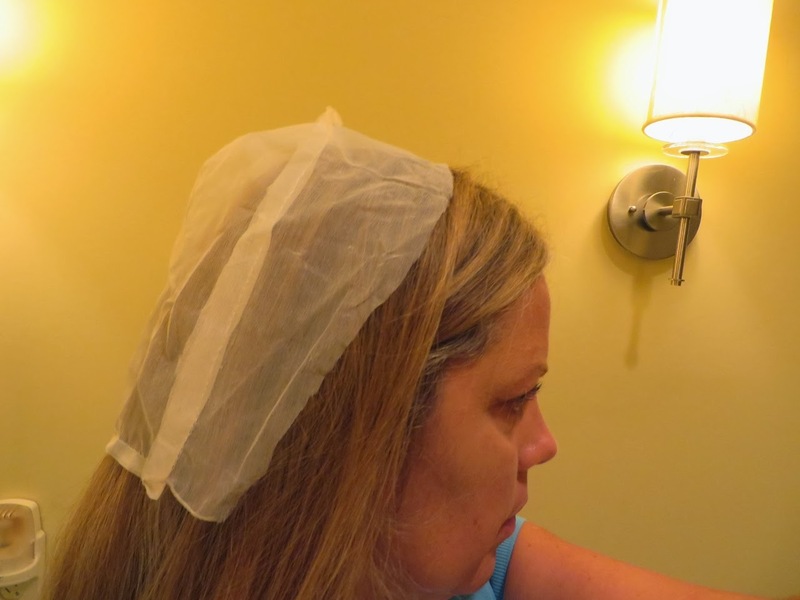 The fabric for this cap is Indian silk gauze from Puresilks.us. It's lovely stuff. It is sewn with Gutermann cotton thread. I should probably use silk filament thread for this but did not want to separate threads from my silk DeVere Silks filament floss; that's not much fun to do. 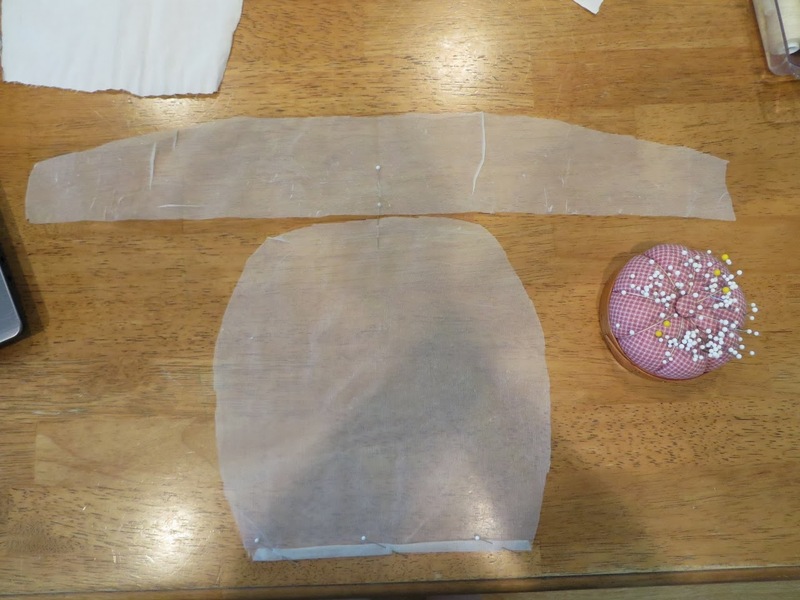 Here are the basic pattern pieces. The wings, top, are in plain form, without extra fabric for gathers or pleating. A quarter of an inch of allowance is accounted for, though. 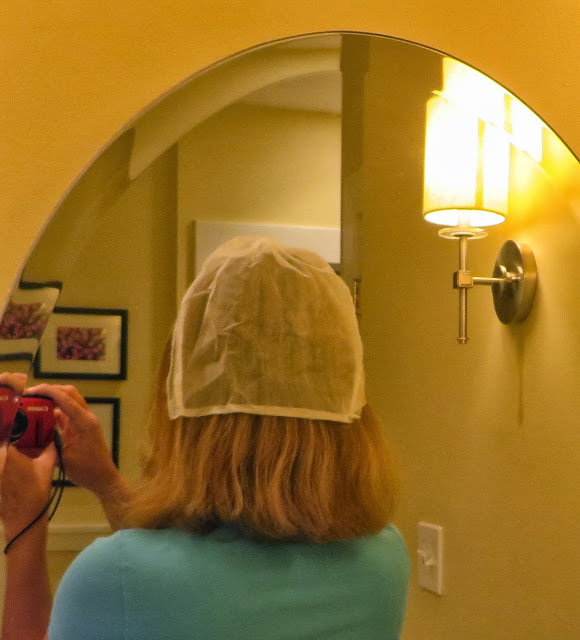 It was a pretty, sunny morning when I cut out the silk gauze for the cap. Miss Blueberry Muffin agrees. The gauze had been heavily starched and pressed before cutting, which made cutting easier and has prevented any fraying. Muffin really is a muffin, isn't she? She spilleth over, despite being on a strict diet. Of course, she is stockily built; her legs are short and paws are broad. She is built for snow and cold: wait until you see her winter coat! Okay, back to the cap. 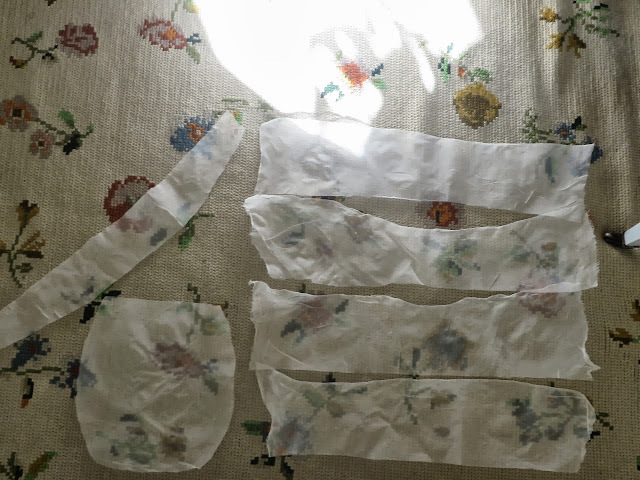 Here below are the pattern pieces, cut into silk gauze. The four long narrow pieces are the wings. They have not been shaped yet. One long side is the selvage. It appears a little wavy due to the starching, but has been straightened pretty well. You can see how sheer the gauze is. for the carpet pattern shows right through. It's a knitted wool carpet, by the way. Neat! The image below shows the band, top, and the caul, bottom. You will notice that the caul as cut out is wider than the pattern. I cut it wider so as to have more to gather into the band, for a more capacious fit. First, I found the center of the band, and marked it with the pin, for later reference. Second, I turned up a 1/4" channel on the straight portion of the caul by folding over the bottom of the caul twice, and whipped it closed. Tapes will go through the channel and be pulled shut to pull the caul into a rounded shape that will fit the back of the head. Here is a closer view of the gathering channel. Next, I found the center of the top of the arch on the caul, measured out about 2 inches from each side, and gathered them tightly up. I held the gathers in place with a pin. After that, I found the center of the top of the caul again and matched it to the center pin mark on the band. I pinned the two together. Then I took one end of the band, and pinned it to one bottom end of the caul, leaving about one quarter inch sticking out beyond the end, Then I found the other end of the band, and pinned it to the other bottom end of the caul, again leaving the band sticking out a quarter of an inch. The next step was to make as narrow a hem as possible on the ends of the band, so they would be flush with the end of the caul. Sorry that I don't have a picture of that! Then the band and caul were eased together so that the sides of the band were smooth and all of the gathering was kept to the top center of the caul. Using black thread, I basted the caul and band together, leaving a quarter-inch seam allowance. You can see that I basted right over the gathered portion of the caul. The seam was then sewn for real using a small spaced backstitch. The valley of each gather in the gathered portion was sewn down so as not to squash the gathers. I did not sew all the way to the end of the caul: I left a little room for each end of the channel. Once two tiny 1/8" wide cotton tapes are added to the inside of each end of the channel, then I'll close the space up. Now we have the back and band for the cap. After the wings are sewn on, I will go back and grade all the allowances and then fell them carefully down. Here is what we have so far, from the back. Remember that the tapes aren't yet in the gathering channel on the caul. When in, pulled close and tied, the caul will puff and the cap fit more closely. Here's what we have from the side, again. I've worn it inside out to show the seam allowances. They will be graded, remember, and felled down. Next post, we will create the wings to fit to the front of the cap, and sew them on. That's been fun to figure out, surprisingly. I did it one way, saw that the results were less refined than hoped, rethought and redid the them and had better resuts, but because I didn't write down my process carefully beforehand, forgot a key construction method, so I am on my third try. Let's hope it's the charm. Before I leave you, some fun. School is closed for fall break, so the boys have played more or less peacefully this morning. A few minutes ago I could hear Noah's feet as he padded up the stairs. 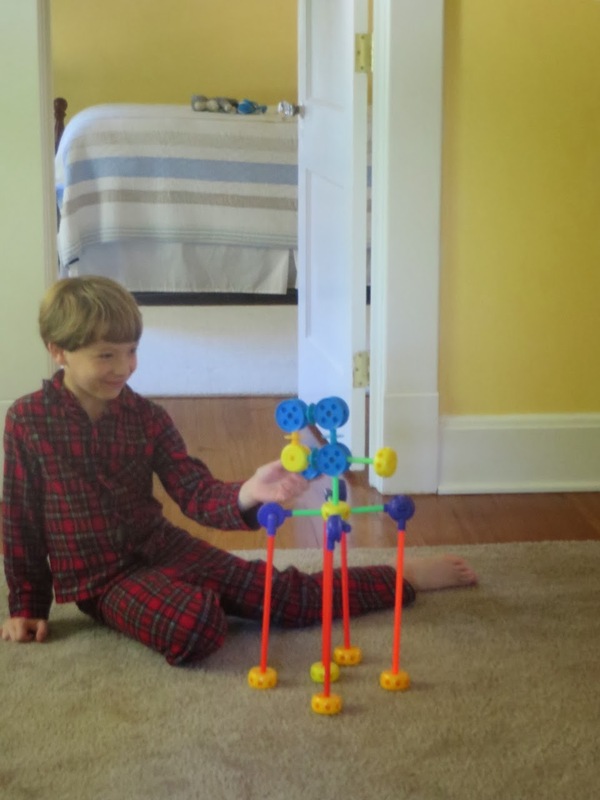 He was coming to show me his new invention: a video camera for filming horsey's football game. Horsey is cantering out of view, helped by Christopher, but here is Noah, filming. I'm not sure what impresses me more; making a cap from scratch, or cutting out fabric with Muffin the cat on the floor and her NOT playing with the fabric! My kitties love to mess with my sewing. Someday I'm going to end up sewing one of them into a garment! Nice job on the cap. Thank you, Jeanne! 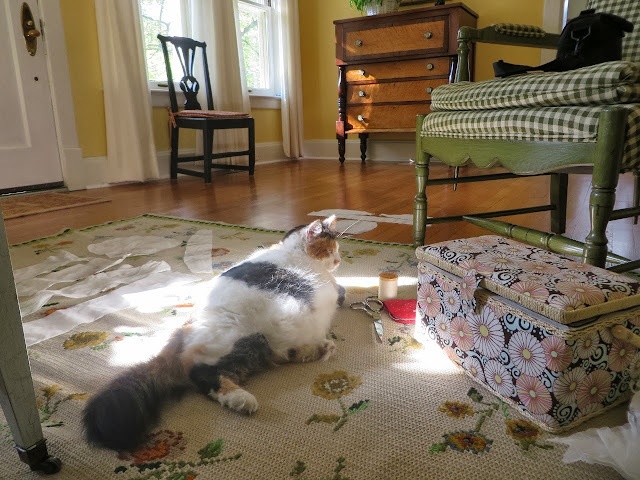 Sometimes Muffin does attack fabric, but that morning the sunshine had loosened her muscles to the point that all she could do was stretch her paws and roll onto her back. Funny about a kitty being sewn up; the escape would be dramatic. Thank you for yet another installemnt! I look forward to see your finished cap! Can't wait to see this all come together! I have a hard time with caps, so it's good to see your process. I love it to have my cats gathered around me when working at the sewing table, they know how to relax! Thank you all. Silk gauze is deceptive. While it's very sheer, and it's easy to displace the weave such that holes appear, the silk thread itself is quite strong. Cassidy, caps are odd. Because they're small and require your best stitchery, they're fiddly to make. On the other hand, you're not handling loads of fabric, so they're easy to work on. Thanks about Muffin. She's a sweet, affectionate miss. Love Muffin, love the cap, love the bits of your home visible in these photos. 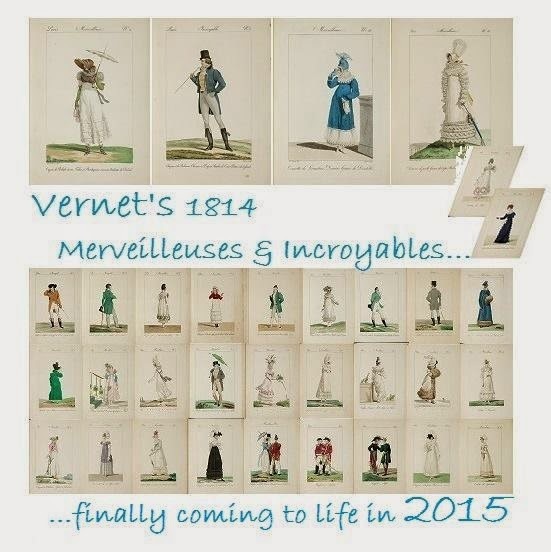 It would take a dormeuse to get me interested in sewing again! :} It was just such a nice sunny morning, ended up taking lots of kitty pictures. 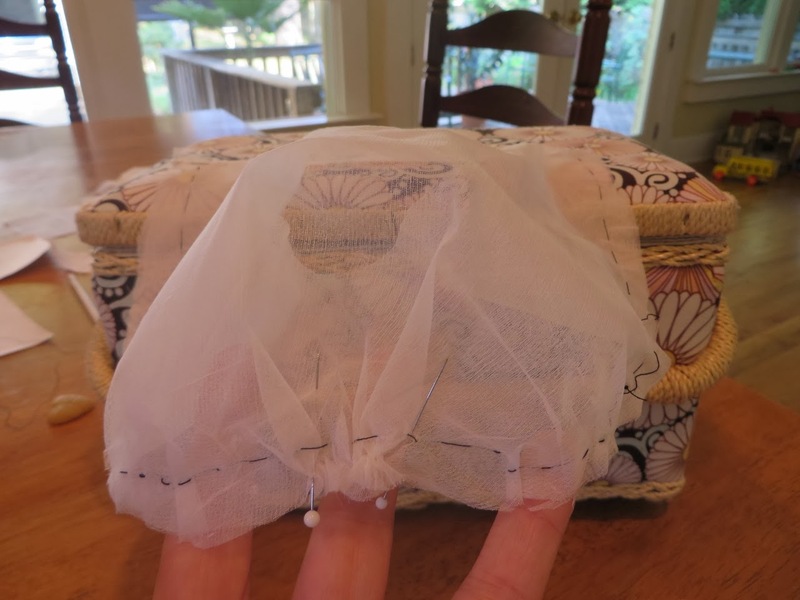 Oh, I hope you become interested in sewing again, for with the help of your blog and one or two others, my interest in cooking has re-awoken. Having babies put a damper on it for awhile.